Posttraumatic stress disorder (PTSD) is a prevalent and often debilitating condition that follows exposure to a traumatic experience and can result in depression and increased suicide risk in vulnerable individuals. Researchers at the National Center for PTSD at the Department of Veterans Affairs in Boston, Boston University and Healthcore – New England Research Institutes are conducting a long-term observational study investigating PTSD symptom trajectories among male and female veterans who served in Iraq and Afghanistan. PTSD is an often-debilitating mental disorder that usually develops as a response to one or more traumatic events. Men and women serving in combat situations are at particular risk for trauma exposure – either themselves or among their fellow combatants. The recent revision of the Diagnostic and Statistical Manual of Mental Disorders criteria (DSM-5) divides PTSD symptoms into four clusters: intrusive thoughts, avoidance, negative alterations in cognitions and mood, and changes in arousal and reactivity. Individuals who develop the disorder tend to re-live their traumatic experiences in the form of intrusive thoughts, nightmares, and/ or flashbacks. They can also display feelings of isolation, anxiety, irritability, and guilt. PTSD is particularly common among war veterans, as their job often involves exposure to crude acts of violence and brutality, as well as death. The condition is most often chronic, although the determinants of remission or relapse are not well understood. Research investigating trends in PTSD among combat-exposed army veterans is of crucial importance, as it can help to gain a better understanding of how the disorder develops and manifests itself in different individuals over time. Given the growing number of women who join the military, studies have also started exploring the nature and extent of gender differences in PTSD-associated symptoms. PTSD has sometimes been described as ‘a signature injury’ for men and women returning from serving in Iraq and Afghanistan, with researchers estimating its prevalence to be around 10–18%. Yet studies exploring PTSD symptom trajectories and gender differences among veterans who served in Operation Enduring Freedom (OEF) and Operation Iraqi Freedom (OIF) are still somewhat limited. 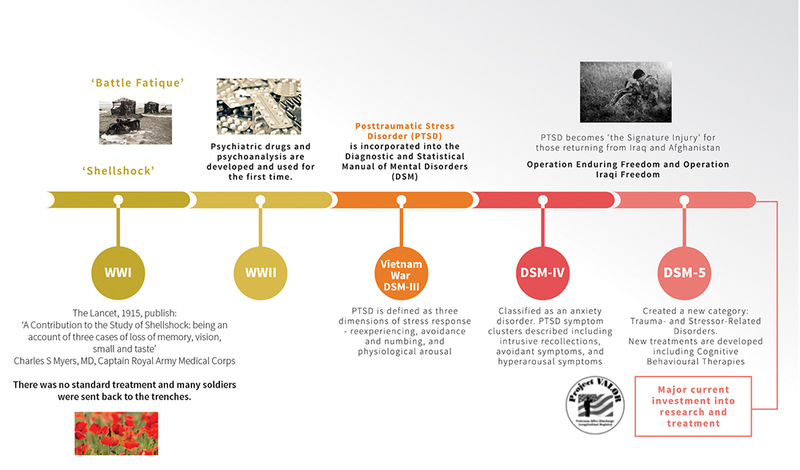 To address these unexplored areas of research, an interdisciplinary research team from the National Center for PTSD, United States Department of Veteran Affairs Boston (VA Boston), Boston University School of Medicine, and HealthCore – New England Research Institutes have designed and are conducting a unique long-term study of the natural history and outcomes of PTSD among combat-exposed veterans who served in Iraq and Afghanistan. Project VALOR (Veterans’ After-discharge Longitudinal Registry) is a long-term observational study developed in response to the need for more in-depth data and a better understanding of the risk factors and resilience predictors among veterans with PTSD. This study is fielded by a highly trained and dedicated research team led by three co-principal investigators, two of whom represent the National Center for PTSD, VA Boston, and Boston University (Drs Terry Keane and Brian Marx) and a third, Co-Principal Investigator, Dr Raymond Rosen, former Professor of Psychiatry and Psychology at Rutgers University, and Principal Scientist at HealthCore – New England Research Institutes. The project was designed following the Agency for Healthcare Quality and Research’s recommendations for longitudinal disease registries. The high level of involvement of participants and effective retention over a long follow up period, in addition to the comprehensive, interview, self-report and medical record data analyses, are unique features of the study. 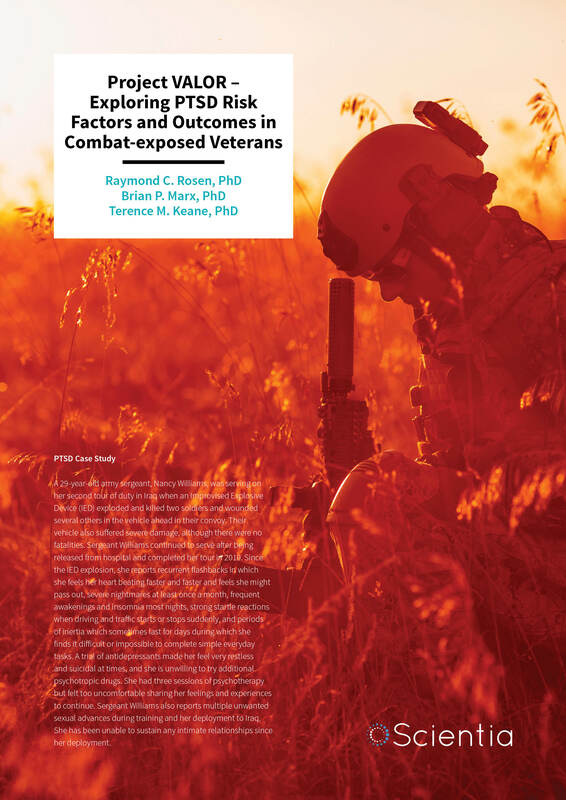 The very broad and in-depth type of data collected by the researchers as part of the primary goal of the VALOR registry allowed them to test multiple hypotheses and research questions related to long-term trajectories or outcomes of PTSD in combat-exposed veterans. • First comprehensive, gender- balanced longitudinal study of PTSD outcomes in combat-exposed veterans returning from Iraq and Afghanistan. • Most comprehensive assessment to date of medical records, interview data and self-report questionnaires from more than 1500 combat exposed veterans. • Longitudinal data collected at four separate time intervals between 2008 and 2016. • Multivariate trajectory analyses to assess outcome pathways and predictors. • Inclusion of a large comparison group (400) of male and female veterans without PTSD. The primary aims of Project VALOR were to examine trajectories of PTSD symptomatology and diagnosis – the nature and the extent of military sexual trauma and associations of PTSD with mild traumatic brain injury, major depressive disorder, and suicidal ideation among combat-exposed women and men. After analysing the data collected from participating veterans, the researchers found risk factors and outcomes of PTSD to be remarkably similar across different genders, for all but one assessed factor. They explain that: ‘Female veterans have many of the same psychological reactions to PTSD and share many of the same risk factors as men, with one notable exception – female veterans report substantially higher rates of military sexual trauma than their male counterparts.’ Health-related quality of life, a term that describes the quality of psychosocial functioning within and across domains (such as work, relationships and education), was generally similar in participating veterans with PTSD, regardless of their gender. Both male and female veterans with PTSD also reported long-term physical changes, termed ‘premature ageing’, which included features of a metabolic syndrome, such as weight gain, blood pressure and cholesterol increase, and greater risk of type two diabetes. Study participants who had falsenegative PTSD diagnoses, meaning they were initially not diagnosed but were found to have PTSD using the researchers’ diagnostic measures, were more likely to report lower levels of combat exposure, panic, and PTSD avoidance symptoms. Candidates with false-positives, whose PTSD diagnoses were not confirmed by the interviews and questionnaires, were more likely to have sought treatment for emotional problems and reported less functional impairment. On the other hand, the majority of veterans with concordant diagnoses (i.e., true positives) reported severe symptoms and other co-existing conditions, such as depression or substance abuse. Overall, individuals who presented the most and least severe symptoms in the diagnostic interview were more likely to have matching past and present diagnoses. Project VALOR is a carefully designed and timely registry study that collected data to help better evaluate the clinical course and health outcomes of PTSD in combat-exposed veterans returning from Iraq and Afghanistan. The data registry compiled by Dr Rosen, Dr Marx and Dr Keane is a uniquely useful resource, designed to assist researchers, military leaders, and treatment providers who are looking to better understand PTSD and related problems among combatexposed veterans. Studies carried out by Drs Keane, Marx, and Rosen revealed important information about diagnostic accuracy and the determinants of discordance between research and clinical diagnoses, as well as gender differences (relatively few) and the long-term associations and consequences of PTSD (relatively many). Those with more severe symptoms were less likely to be misdiagnosed, in addition to veterans with other medical or psychiatric conditions. Signs of traumatic brain injury (TBI) were evident in three of four (74.8%) male veterans with PTSD, and almost half (48.0%) of female veterans with PTSD had also showed signs of TBI. Among the women, approximately one-quarter of female veterans (28.8%) had personal experience of military sexual assault. Among male veterans, evidence of traumatic brain injury was predictive, along with PTSD symptoms and signs of depression, of a significant increase in suicidal thoughts and urges. Future plans for the registry include, ‘determining the longterm impact of medical and psychological treatments for VALOR participants with PTSD and examining other biological and psychological sequelae to long-term PTSD exposure,’ says the team of researchers. The VALOR registry has already contributed important new data on the association of metabolic syndrome and premature ageing in both male and female veterans with PTSD. • Female veterans have similar sequelae and PTSD outcome trajectories to male veterans, despite a higher reported prevalence of military sexual trauma than their male counterparts. Signs of premature ageing were observed in both male and female veterans with PTSD. • Veterans with PTSD had markedly elevated rates of depressed mood, sleep difficulties and interpersonal problems compared to the non-PTSD group. Veterans with PTSD also had higher rates of minimal brain injury (mTBI) compared to those without PTSD. • The team observed a mismatch rate of about 30% between the medical records and interview-based diagnoses of PTSD. Approximately half of the mismatched diagnoses were in the direction of false positives, and half were in the false negative direction (i.e., diagnosis on interview, but not in the medical record). • Suicide risk was significantly greater in both male and female veterans with more intense combat experiences, and among those with a history of mild traumatic brain injury with or without depression. The investigators plan to continue their analysis of longterm outcomes or trajectories of care among veterans with or without disability benefits, and among those engaged in medical or psychological treatments. Researchers are likely to continue using the data to identify long-term trends in PTSD symptoms and sequelae among male and female returning veterans. Eventually, this could lead to better-tailored treatments, more reliable diagnoses, and to the identification of specific PTSD risk factors. Dr Raymond C. Rosen is a Principal Research Scientist at HealthCore/ New England Research Institutes and former Professor of Psychiatry and Psychology at Rutgers University, New Jersey. He had undergraduate training at the University of Witwatersrand, Johannesburg, South Africa and received his PhD in Clinical Psychology from State University of New York at Stony Brook in 1972. 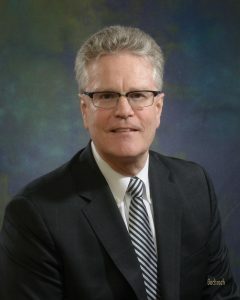 He served as Chief Psychologist and Associate Dean at Rutgers Medical School from 1995–2005, prior to joining New England Research Institutes in 2006. His major areas of research include mental health disorders and treatments, with a special focus on Post-Traumatic Stress Disorder (PTSD), insomnia and other sleep disorders, patient outcomes and quality of life, and men’s and women’s sexual health. 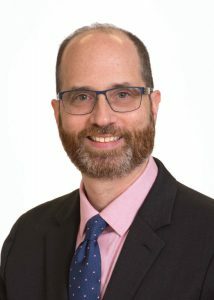 Dr Rosen has designed and directed several large, longitudinal registry studies of health outcomes, including Project VALOR. Brian P. Marx, PhD, is a professor at Boston University. He holds a BS in Psychology from Boston University and a PhD in Clinical Psychology from the University of Mississippi. Dr Marx has worked as a professor at several universities, including Oklahoma State University, the University of Oklahoma, Temple University, and Boston University. For over a decade, he has also been working as a staff psychologist at the National Center for PTSD at the Department of Veterans Affairs (VA) Boston. 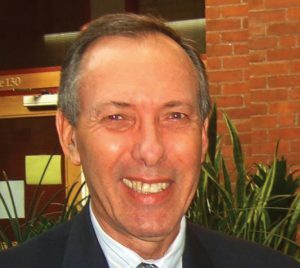 Over the course of his career, Dr Marx has received multiple awards, honours and grants and has a large number of publications in his name, exploring his primary research interest, Post-Traumatic Stress Disorder (PTSD). Terence M. Keane, PhD, is a Professor and the Assistant Dean for Research at Boston University. He has attained a BS in Psychology from the University of Rochester, as well as an MA and PhD in Clinical Psychology from Binghamton University. Dr Keane has worked as a Professor of Psychiatry at the University of Mississippi Medical Centre, Tufts University School of Medicine and Boston University. He has also covered positions in Veteran Affairs medical centres and is currently the Director of the Behavioral Sciences Division at the National Center for PTSD and the Associate Chief of Staff for Research & Development at the VA Boston Healthcare System.